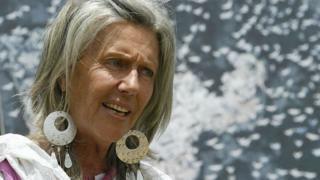 Kenya has arrested an unspecified number of suspects and recovered a gun potentially linked to the shooting of conservationist Kuki Gallmann, the country's interior minister said. The 73-year old author of I Dreamed of Africa was injured in an ambush at her conservation park on Sunday. Ms Gallmann's family said she was in intensive care at a Nairobi hospital. She endured a seven-hour operation after being airlifted there for treatment. "We have recovered a gun which is now undergoing ballistic tests to confirm whether it was the gun used to shoot Kuki," Joseph Nkaissery, Kenya's interior minister, told a news conference. He did not say how many suspects had been detained. While Mr Nkaissery described the attack as an "isolated" act of banditry, the Laikipia region where it happened has seen a wave of violence in recent weeks. As well as the Laikipia Nature Conservancy, Ms Gallman ran a luxury safari lodge that was burned down last month by suspected cattle herders. Herders have been invading private property in the drought-hit area in search of fresh grazing land. British rancher Tristan Voorspuy, who also ran a safari company, was shot dead in early March while inspecting his lodges in Laikipia. The region, which covers about 10,000 sq km in Kenya's central highlands, is home to some of the country's largest white landowners. At least a dozen civilians and police officers have died in the violence there, and tens of thousands of head of cattle are thought to have been driven on to private land. The BBC's Alastair Leithead tried to approach herders last month to ask about their grievances, but was forced to retreat when they shot at him. Are Kenya ranch invasions driven by drought or politics? There is no confirmation of who carried out the attack on Ms Gallmann, who was reportedly shot in the stomach. Ms Gallmann owns about 360 sq km in Laikipia. Her organisation also runs community, education, arts and sports projects. Born in Italy, she moved to Kenya in 1972 with her husband and son, who both subsequently died in separate accidents. She later became a Kenyan citizen. I Dreamed of Africa was turned into a film starring Kim Basinger. Are invasions driven by drought or politics?